This District is home to a lot of the city’s shopping, commercial and business functions. The Style Mile acts as the retail spine anchored by Buchanan Galleries to the north and St Enoch Shopping Centre to the south. George Square is the major public, civic and event space. 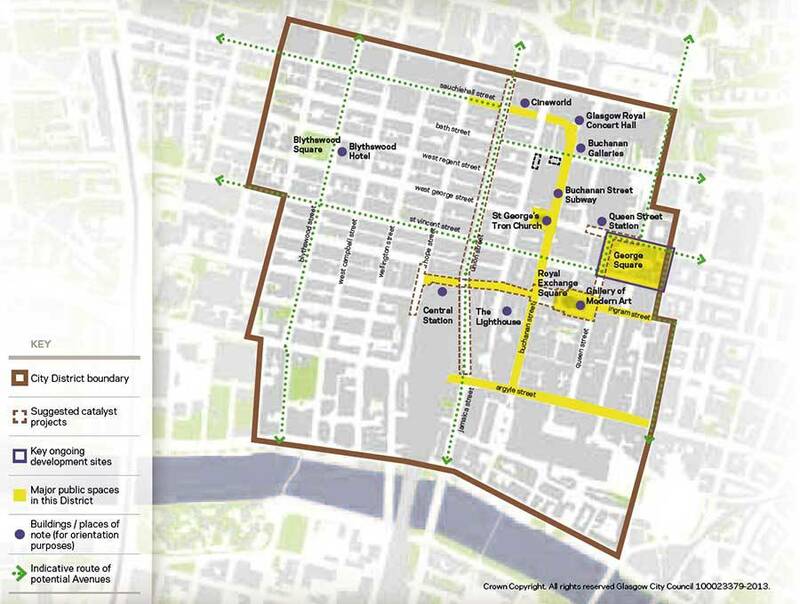 The area’s grid street pattern contains the two main train stations, Central Station on Gordon Street and Queen Street Station on George Street. The principal bus routes connecting to the wider city are located on Union Street / Renfield Street and Hope Street. There are opportunities to look at how buildings are used, particularly spaces above retail and the flexibility in terms of change of use to respond to the changes in city centre Living and the ambition to increase the residential population. Find out the latest news about Central here.